Pope Francis has appointed 19 new cardinals at St Peter’s Basilica ceremony in Rome. This is the first such appointments of Pope Francis’ papacy. Correspondents say the inclusion of prelates from places such as Haiti and Burkina Faso reflects the Argentine Pope’s commitment to the poor. Former Pope Benedict XVI – who retired last year – also attended the ceremony at St Peter’s Basilica. One by one, the cardinals knelt in front of Pope Francis to receive the hat and gold ring of office. Mindful of current conflicts in Ukraine, Syria and the Central African Republic, Pope Francis prayed for “peace and reconciliation for people currently experiencing violence and war”. Sixteen of the new appointees are under 80 – the age limit for participating in the election of future popes. Pope Francis is encouraging cardinals – old and new – to think outside the box in formulating new policies for the Catholic Church. 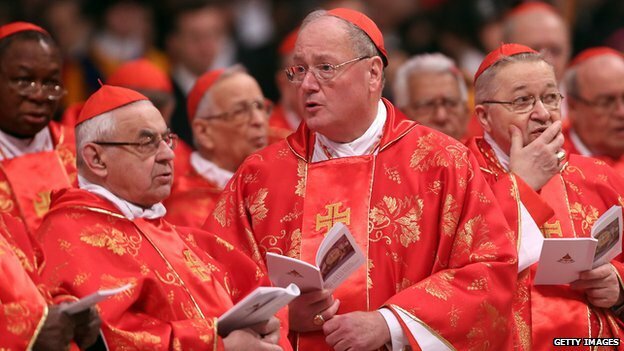 The new cardinals will join the more than 100-strong College of Cardinals, which has been meeting in plenary session behind closed doors at the Vatican.